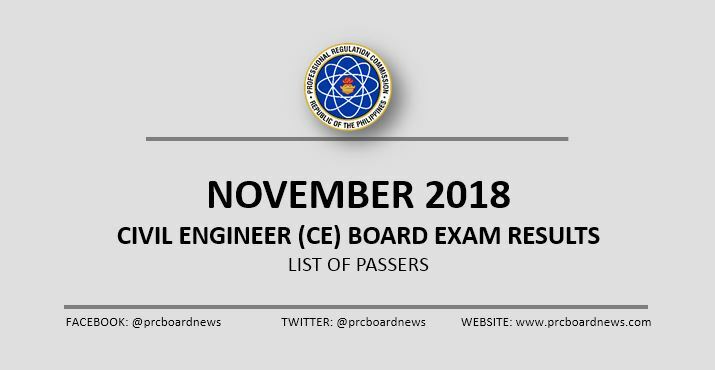 MANILA, Philippines – The Professional Regulation Commission (PRC) and the Board of Civil Engineering released results of November 2018 Civil Engineer board exam on November 15 or in four (4) working days after the last day of exam. The official list of passers, top 10 (topnotchers), top performing schools and performance of schools are available on this page as announced online. As announced, 6,262 out of 13,887 passed the exams. PRC administered the Civil Engineer licensure exam in the cities of Manila, Baguio, Cagayan de Oro, Cebu, Davao, Iloilo, Legaspi, Lucena, Tacloban, Tuguegarao and Zamboanga on November 10 and 11, 2018. The two-day Civil Engineer board exams covered the following major subjects: mathematics, surveying and transportation engineering (35%), hydraulics and geotechnical engineering (30%) and structural engineering and construction (35%). According to PRC Resolution No. 2017-1068, the target release of results for the recent civil engineering board exam is on Thursday, November 15 or in four (4) working days after the exam. However, results may be released ahead or on later date without prior notice. We advise examinees to monitor announcement of results starting Wednesday, November 14 or in the usual three (3) working days. In the November 2017 CE board exam, results were released in four (4) working days. PRC named 6,075 out of 12,447 who passed the exam. In the November 2016 exams, results were announced in three (3) working days. A total of 5,036 out of 10,972 successfully hurdled the exams. What time po release ng Civil engineer board exam result? napakasarap balikan ng araw na yan. napakasarap ng pakiramdam. mabuhay kayong lahat mga bagong inhinyero. wag kalimutan ang mga taong nagsakripisyo sa inyo. Go Luigi Buenaventura of BSU Bulacan! sasabog n puso ko s sobrang suspense! hoping and praying n itulot ni Papa God n mpsm name ng anak ko. Engr. narin kapatid ko mamaya! Claim it! Thank You Lord!!! Any news on when they will release the list? Nanenerbyus na c nene sister ko bkit tagal tagal daw ng nov.15?